President Bush poses with Barney at the ranch in Crawford, Texas, Aug. 27, 2002. Courtesy George W. Bush Presidential Library. It is with these words that President George W. Bush remembered his pal Barney when he died of lymphoma at age 12 in 2013. “Barney guarded the South Lawn entrance of the White House as if he were a Secret Service agent,” Bush said. 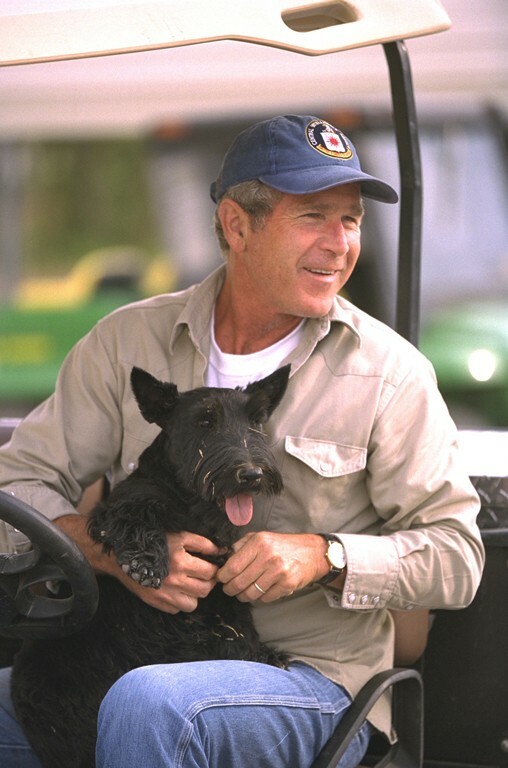 Barney, a Scottish terrier, was a gift to the Bushes shortly after the 2000 presidential election from Christine Todd Whitman, former director of Environmental Protection Agency and the former governor of New Jersey. The dog got to be quite the media star. He had his own website, and Barney Cam featured videos from a dog’s perspective of visiting dignitaries, White House staff and celebrities. Unfortunately, Barney also had a bit of a temper. Apparently he bit the public relations director for the Boston Celtics when she visited the White House as well as a Reuters news reporter. President George W. Bush carries Barney after disembarking Marine One, Sept. 3, 2001. Courtesy of the George W. Bush Presidential Library. 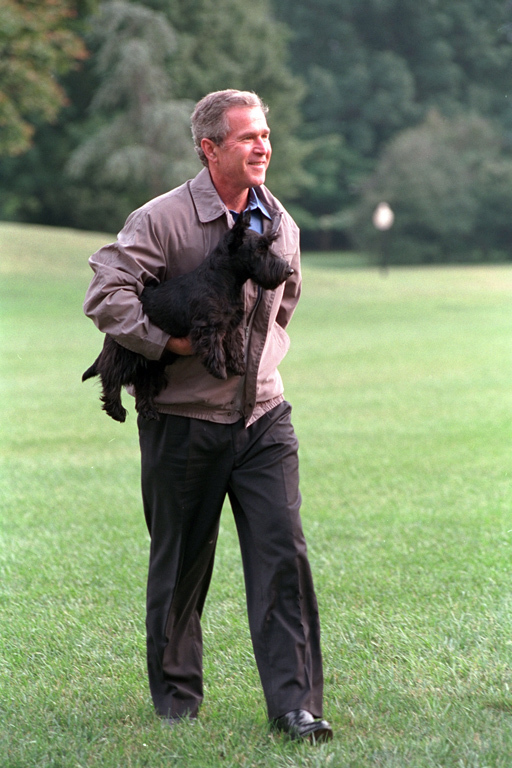 Barney did get along well with Miss Beazley, a female Scottish terrier puppy that the president gave to First Lady Laura Bush as a birthday gift in 2004. Maybe it was something in the blood lines — Miss Beazley was Barney’s niece. It is true that JFK loved playing with his dogs. The same is true of George W. Bush. As such, it is likely that in times of stress the dogs were a great comfort to them.